In the last few days i have found myself feeling irritable. In the past seven years, I have been avoiding holidays. I have begun to even master the art of ignoring holidays. I was on call for work on Easter, now Mothers Day, and next month Fathers Day. Every person will have a coping mechanism for grief, whether they choose it or not. Yesterday, I was messaging with one of my high energy and active mama friends. She volunteered that she wanted to stay inside and hibernate, even though the weather is beautiful. I said "It is interesting that you say this. I have been feeling this way as well. There is something about spring that doesn't always bring joyful thoughts. I am just tired. The whole Mother's Day thing is sad.... Life did not play out the way that we had so meticulously planned... Even though we tried so very hard." She replied that the sharp pangs that are triggered from her memories can be overwhelming. I wholeheartedly agree. Although I spent much of the day in quiet or in bed today, I had previously made arrangements to see a piece of handmade furniture for my home. While meeting with the young mother and artist, I asked where she had obtained the piece of furniture. She stated that this specific piece had been abandoned in a rental home. The owner of the homes had planned to toss it as garbage. Her husband quickly rescued this piece of furniture for his wife. 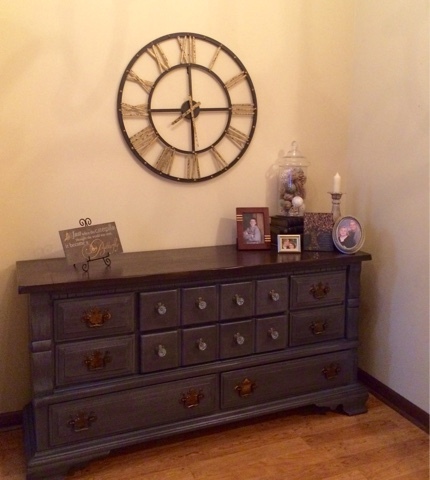 This young woman spent hours of love and time to create an entire new piece of furniture. As a mother who has lost a child, the week of Mother's Day and Logan's birthday is often a time that I have a blurry mind and low energy. I am tempted to immobilize and stay in my home when I am overwhelmed. This is what feels safe to me. The memories of our deceased children are natural and healthy. These children did not disappear... They died. I am thankful that I have living children, however, one child does not replace another. Logan's loss will always be felt. The difference between now versus in previous years- it is healthy talk about it. Mothers have suffered the loss of their children since the beginning of time. We now know that this is the time to give permission to share grief and to not suffer alone by keeping it inside. This is an important note-- You cannot enjoy the past memories if you do not choose to make new memories. The key is to eventually enjoy the past memories and choose to not die too... But to choose to live. This is one way we can honor their lives- by living enough for both of us. Anyway, today I ventured out to make a change...To create a new living space in one area of my home. I am now smiling and I feel better. I love my new little refurbished solid wood dresser/ entryway piece. It is quite fitting and appropriate that I had the opportunity to adopt it today.